The Wildcat Varsity girls opened their season with a Tip-Off Classic tournament on Friday evening. The Ohio State Buckeyes football team was in town to play Purdue at Ross-Ade Stadium the next day. I tried to get a hotel at 8:00pm on Friday night and laughed the hotel attendant off the phone as she quoted me $440.02 for a room with two queen beds for one night. My night would end in a drive to Westfield to stay with family. I would have paid $350 to avoid staying with family, but I am not that high of a roller. Back to the girls. The team is young this year with 12-year-olds to 15-year-olds, but four of them have previous Varsity experience. Friday evening started with the Wildcats playing at 8:30pm, the final game of the evening against the familiar Living Water Marlins. The Living Water Marlins have been a reliable opponent over the last several years and even sport a former Wildcat, Mary Holst. The game went back-and-forth with the Marlins taking an end of 1st Quarter lead of 13-11. The 2nd Quarter was more of the same with the girls battling on both ends to finish the first half with the Wildcats up 24-23. The 3rd Quarter was a repeat of the previous two, with the Wildcats being up 34-33 to start the 4th Quarter. This game would go down to the last minute as the teams were evenly matched and playing with the rust of the first game of the season needing to be knocked off. With a few minutes left the Wildcats had a lead of 41-37, which seemed like the largest margin of the game. I said to Dave Cline, who was running the clock, “The girls need to avoid letting the Marlins score a couple of unanswered buckets, here or they will be right back in it.” The Wildcats turned it over a few times to allow the Marlins to get right back in the game. With 1:07 left Marlins coach, Bob Segall (yes from Fox 59), called 4 of his 5 game timeouts. They were only slowing the inevitable. With under a minute left, Rachel Wirts (12-year-old, 8th grade starter), gets the ball down low, turns, shoots and makes a go-ahead layup. The Cats hold off the Marlins for the next several seconds to close out this nail biter with a score of 43-41. It was a well-deserved opening season win, with many things to improve on and certain strengths revealing themselves. Alyssa Woodard is a one girl wrecking crew (21pts. ), Macy Cline is a stealth, quiet scorer and stealer (8pts. ), Rachel Wirts is going to develop as an inside force for rebounding, blocking, and never-ending layups (6pts.). Louisa Shook put in 4 points and is the cerebral point guard of this club that holds it all together. Hannah Ruddle has developed this unstoppable runner/floater that can’t be guarded as she scooped in 3 points. Holly Woodard put in her first free throw and point of her Varsity career. More on Ali Bialek in the next games. After a great season opener against the Marlins, the Wildcats were facing an opponent in Wabash Valley Warriors JV that stood in their way of advancing to the Championship game. I drove in from Westfield after saving myself $440.02, by not staying in Lafayette at a hotel. I should have paid $300 to go to the Purdue game after saving so much money staying with family the night before, I would have been up $140.02 - but I digress. The Wildcats had the 9:00am game after having the final game from the previous evening (I know-scheduling is difficult). ‘Little rest for the weary’ as the saying goes applies to this group, although many of my fellow Wildcat families are high rollers and stayed in Lafayette the previous evening, shortening their commute. The Wildcat girls faced an opponent that was even younger and less experienced than them. It got out of hand early with the 1st Quarter ending in a 23-4 Wildcat lead. At the half, every Wildcat had scored, and the lead extended 35-7. Macy Cline had prior commitments of a Regional Cross-Country meet, where she beats all girls of her age group and above, and a softball tournament. The Wildcats had to play without her great contribution. 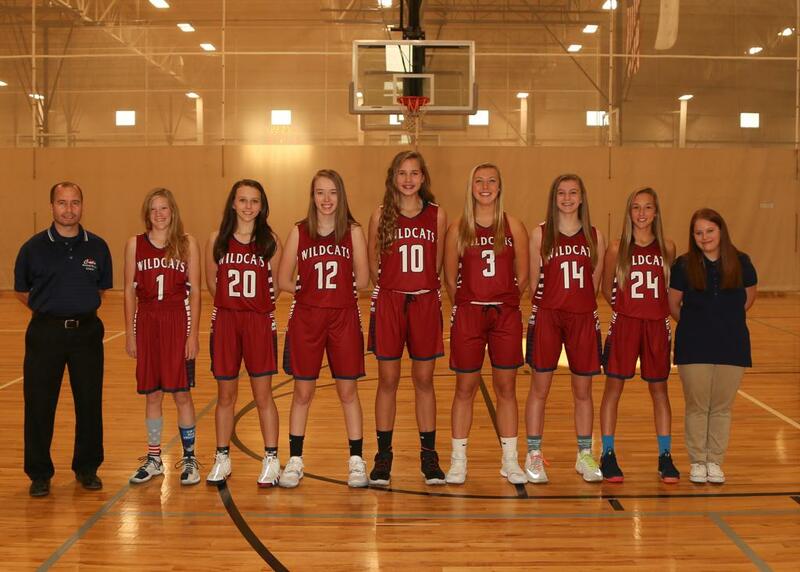 The Wildcats are about 8 total Varsity girls deep this season, and all their contributions are needed. Therefore, what the team did even without a few girls this weekend was a great accomplishment. This game ended 57-13 and was difficult to watch from the Wabash Valley perspective. I have a hard time watching blowouts, no matter what end of the score the Wildcats are on. Alyssa Woodard put in 21pts, Hanna Ruddle-Runner-Floater ended up with 14pts., Louisa ‘Cerebral’ Shook had 14 pts., Rachel Wirts racked up 10 pts., Ali Bialek had her first 2 points of her Varsity career, and Holly Woodard rounded it out with 2 points of her own. This was a total team effort. This win should have set up the Wildcats to play the team that ended up second in the B Pool. That would have been the Marlins JV team, but the JV team was the same as the Varsity team for the Marlins and they had played 6 games over this weekend. Therefore, the Marlins forfeited their game against the CEC from Louisville, who the Wildcats had their eye on as the Championship opponent. The Wildcats had to play the Ft. Wayne Guardians as the CEC Louisville team got to rest and watch the Wildcat game because of the Marlins’ forfeiture. After way too many bananas and protein bars over a 4-hour window, the Wildcat girls were ready to face their 3rd opponent of this Tip-Off Classic weekend. The Fort Wayne Guardians were actually a young JV team, but as the clock worker, brother, fellow boys team player told me about his two sisters that were on the team, “This is the girls 3rd year as a team and they have yet to win a game”. He laughed, I laughed, I began to cry, but he continued to laugh so I felt bad about crying so I got back to keeping book. He did say, “Our team is losing by a lot, but your girls are so nice about it.” I gave some encouraging words about sticking together when you are young will payoff when you get older-type of mumbo jumbo. Something I have told way too many parents over the last two years to no avail – but I digress again – Sorry! This one was over in the 1st Quarter when it was 21-2. The 2 points stayed on the scoreboard until the 4th Quarter when the referees gave a girl 3 foul shots on a non-three-point attempt. Good for her that she made all three free throws in a row to close out the game 50-5. I could have complained about that call as the official bookkeeper, but I let it slide – Go Guardians for the future! Alyssa Woodard had 12pts., Rachel Wirts had 12pts., Louisa Shook had 10pts., Hannah Ruddle had 8pts, Ali Bialek had 4 pts., and Holly Woodard finished up with 4 pts. A team effort, but a third game for the weekend before facing the rested, only two games played CEC Louisville team for the Championship. Too bad Macy Cline’s Cross-Ball tournament or whatever it was didn’t get rained out in Columbus (we guilt texted her about the start time of the Championship game anyway). Did I mention that Louisville had a full 12 players rested and ready to play the final game of the tournament? As a Junior High boys’ game started, the Wildcat girls rested for their final, fourth game of the weekend. The CEC Varsity girls had beaten the Varsity Wildcat girls last season by about 20 points. Coach, Nick Tharp, knew this was going to be a difficult game, but he had high hopes for the girls as the never-ending optimist. He knew he had talented players with a scrappy attitude of fighting against older, more experienced players. He was right. The Wildcats came out roaring with Alyssa Woodard putting up 9 points in the first quarter as Louisa Shook added 4 points and Hannah and Holly both contributing 2 points each. The 1st Quarter ended with the Wildcats up 17-9. The 2nd Quarter started the same way with Alyssa Woodard putting in 3 two-point buckets and adding 2 three-point shots. Louisa Shook put in 2 points as Holly, Alyssa’s sister added a free-throw. The Wildcats ended up with 32 points and the lead at the half! The problem was that the lead was only 3 points. My fellow bookkeeper on the other end of the table told his CEC Louisville Varsity coach the problem, “Alyssa Woodard has scored 21 of their points, so we need to shut her down.” This was the second half strategy that CEC was going to implement. Unfortunately, in the third quarter it worked. CEC double teamed or always had a second girl in the area of Alyssa Woodard as they kept her to 5 points. Louisa Shook added 4 more points for the Wildcats, but the lead had slipped away and belonged to the CEC team by the end of the third quarter (49-41). In the fourth quarter a few things happened to reveal the heart of this Varsity Wildcat girls’ team. First, Holly Woodard had shot 1 of 4 from the field and was relatively cold in the last few games. Hoppin’ Holly went down on the floor as her leg looked like a piece of spaghetti when she rolled her ankle. As she came off the floor crying, I thought her season may be over (overreacting dad), and one less Wildcat would be along for this not-too-deep bench, ride. But Julayne Wirts, a nurse by trade, strapped up that ankle, had Holly walk it off for a few minutes, and the Wildcat was ready to come back in. One-legged, Hoppin’ Holly came in and made four straight shots from the field and then capped off her 11 point 4th Quarter with a three-point shot - swish or bank or something that didn’t look exactly planned! In the meantime, Louisa Shook went down with an ankle roll of her own. This put her out for the remainder of the game as Ali Bialek did an outstanding job of stepping in and taking over Louisa’s role for the game. Finally, Rachel Wirts fouled out of the game with a few minutes to go. The Wildcats ended up with only 4 players available to finish out the game versus 5 players on the floor for CEC. What started out so well, eventually ended up running out of gas (69-54), but it was an exciting tournament run! The Varsity girls won the second-place trophy in the Tip-Off Classic, but are positioned to take first next year in beautiful Lafayette, IN.